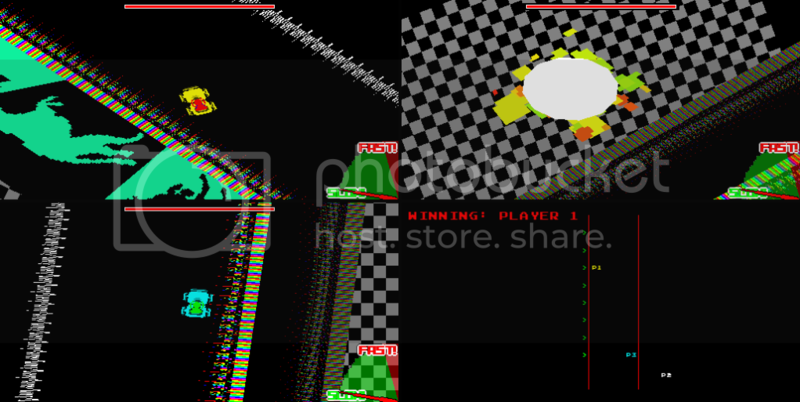 A rough three player racing game with some insane visuals. I kind of want to make it really cheap, with items/powerups that can do some major damage to your foes. Sort of like the battle modes in Mario Kart. Any ideas/suggestions welcome! Hey man, I really liked what I played ! Mind you,I only played Single-player. Love the trippy graphics for some reason it sort of reminded me of Tempest 2000 from back in the day. Music was awesome and very fitting, did you make it ? I was sorta confused as to what was going on, to be honest. Playing by myself my view was really sort of twisted at an odd angle which sort of inspired a bit of vertigo. Also, is the finish line meant to kill you in this version ? I'd like to see some A.I. opponents for people who don't have other nerds to play with. Also possibly make it so that one player can take up the whole screen (though perhaps I missed that somewhere). So far, very good ! All things considered it seems your game has a bright future.